SFC had their second Half Past Twelve Concert of the fall semester. 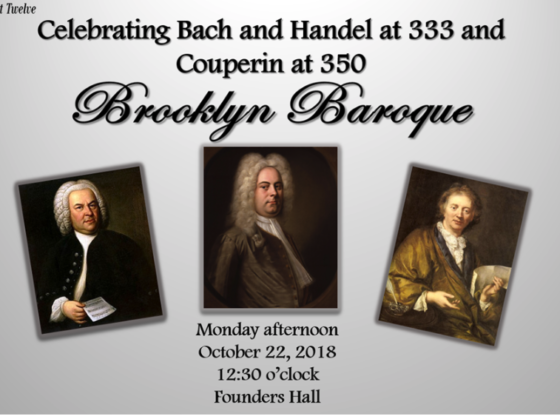 This week’s concert was in celebration of Bach and Handle. The performance included instruments such as the harpsichord, the violin, and a cello. The harpsichord was played by Rebecca Pechefsky who has six albums of her performances, most recently in Europe. Philip Anderson was the tenor at today’s event. He had been recently touring the world singing opera. Jeremy Rhizor played the violin. Rhizor is the founder of the academy of Sacred and Freschi in Sweden. Rhizor is popularly known for performing 17th century Italian composers. David Bakamjian Performed on the cello. Bakamjian has regularly played at concert halls such as Carnegie Hall. The group took turns playing their instruments in pairs as well as performing solo when playing the Handle, Couperin, and Bach compositions. Between each song they gave background information about each composer and the song they were going to play. There will be one more concert on November 12th celebrating Lenard Bernstein.